This study is focused on the provision of basic information for the levels of trace metals including (Mn, Fe, Co, Cu, As, Se and Zn) in eggshell and egg content of four domestic birds species, such information had previously been rare in Malaysia. The relationship among the metal concentrations in eggshell and egg of the four species were also examined. The eggs were collected from poultry farm located in rural area in Kajang, Malaysia. Heavy metals concentrations were measured using inductively coupled plasma mass spectrometry (ICP-MS). Generally, the high levels of Mn, Cu, As, Se and Zn were found in the egg content of four species. While, Fe and Co showed high level in eggshell. Quail egg content has the highest concentration of Mn, Fe, Co, Cu among the four species. However, the chicken eggs gathered elevated level of arsenic. Though, Se level demonstrated a small fluctuation among birds species. Significant correlation observed between levels of Co, Cu, As and Fe in eggshell and egg content of birds species. Salwa A. Abduljaleel, M. Shuhaimi- Othman and Abdulsalam Babji, 2011. Variation in Trace Elements Levels among Chicken, Quail, Guinea Fowl and Pigeon Eggshell and Egg Content. Research Journal of Environmental Toxicology, 5: 301-308. Attention in the trace elements contents of avian eggs is increasingly necessary for different purposes. Considering to the nutritional value of eggs food for humans consumption (Kovacs-Nolan et al., 2005; Sparks, 2006) function for embryonic development (Surai, 2002) and eggs used as evidence for environmental pollution since, they can accumulate heavy metals from diet and surrounding environment (Burger et al., 2009). Eggs of birds has been used in numerous studies to monitor the contamination because it has several advantages over the internal tissues of birds (Burger and Gochfeld, 1988) due, the egg has a composition very coherent unlike other traditional tissues such as liver. In addition, sampling of eggs takes little time, they are easy to handle and can be collected with little interference than the sampling of adults (Furness, 1993). It is known; egg has nutritional and economic importance, due the eggs is highly nutritious, they contain a wealth of vitamins, minerals and are one of the best sources of high quality protein. Chicken egg protein is a rich source of the essential amino acid (leucine) which is important in modulating the use of glucose by skeletal muscle and in facilitating muscle recovery after exercise (Layman and Rodriguez, 2009; Wolfe, 2006). On other hand, metals have positive and negative effect on human health and environment. Several researches including Fakayode and Olu-Owolabi (2003), Nisianakis et al. (2009) and Van Overmeire et al. (2006) have determined different concentration of heavy metals in egg content (yolk and albumin) in chicken egg or other domestic birds. They concluded that there is variation among trace element content in the eggs. Some trace metals are essential like Mn, Fe, Cu, Co, Se and Zn those can play a perfect role in the inherent mechanisms regulating imperative biological processes (Shang and Wang, 1997). Whereas, others metals are non essential such as Cd, As and Pb. Toxic elements can be harmful even at low concentrations when ingested over a long period of time (Ohlendorf and Harrison, 1986; Young, 2005). Meanwhile, metals concentration in eggs of wild birds were used as an indicator of exposure and of potential effects of pollution (Burger and Eichhorst, 2005) since avian eggs have been shown to be vulnerable to external application of toxicants and represent local exposure of the adults have laid them (Burger, 1993). Furthermore, they have been shown to reflect metals uptake from local foraging more closely than tissue from adult birds (Parslow and Jefferies, 1977). Hence, The present study is focused on evaluating the trace elements concentration including manganese (Mn), iron (Fe), cobalt (Co), cupper (Cu), arsenic (As), selenium (Se) and Zinc (Zn) in eggshell and egg content of chicken, quail, guinea fowl and pigeon to assess differences among metals content for domestic avian species and to clarify the relationship among metals levels in the eggshell and egg content in each species. Reagents: The reagents with suprapur quality, analytical grade Nitric acid (70%) and hydrogen peroxide (30%) were acquired from Merck (Darmstadt, Germany) along with the stock standard solutions of Mn, Fe, Co, Cu, As, Se and Zn in concentrations of 1,000 mg L-1. Prior to the experiments the equipment were sterilised by soaking them overnight in diluted nitric acid (10%) and were later rinsed with deionised water. The experiments were conducted using the distilled deionised water. Apparatus: In current study we have used Perkin Elmer model Elan 9000 inductively coupled plasma-mass spectrometry (ICP-MS, USA), After calibrating the instrument with standard solutions derived from commercial materials, it was optimized according to the manufacturing standards. The cones and tubes were carefully cleaned to get purge of any possible residues. Samples collection and samples preparation: Eggs sample from chicken (Gallus gallus), quail (Coturnix coturnix japonica), guinea fowl (Numida meleagris) and pigeon (Columba livia) were collected from poultry farm located in a rural area in Kajang city (latitude 2°59 ′N, longitude 101°47´E) Selangor, Malaysia. Birds were fed on a common feed. For the purpose of this study about 30 eggs (for each species) were chosen randomly during the period (from May to October 2010), all eggs were weighed, chicken egg (40.79±4.01 g), guinea fowl egg (38.55±1.75 g), quail egg (11.38±0.87 g) and pigeon egg (12.16±1.35 g). To analyze the metals in eggshell and egg content the eggs were washed vigorously with de ionized water, the eggs were open carefully and the eggshell separated from egg content. Eggshell was washed to remove all adjacent egg content, the egg content were homogenizes and put it in Petri dishes. All samples were drying at 70°C until constant weight was obtained then the eggshell and egg content grained to powder by mortar 0.5 g of the sample soaked in nitric acid 70% and hydrogen peroxide 30% overnight in room temperature, the digested completed in bloke thermostat (150°C) for 4 h until solution were clear. After cooling the residues were filtered through 0.45 μm Whatman filter paper (Whitman International Ltd. Cat) and transferred to a 50 mL volumetric flask and diluted to level with deionised water. Analytical blanks were run in the same way as the samples and determined using standard solutions, prepared in the same acid matrix. The solutions were stored at 4°C for later metal analysis. As discussed prior Concentration of Mn, Fe, Co, Cu, As, Se and Zn were determined by inductively coupled plasma-mass spectrometry (ICP-MS, model Perkin-Elmer Elan 9000 A). Each analysis was carried in duplicate. All concentration were expressed in μg g-1 on dry weight basis. Statistical analysis: Due to the lack of normal distribution of data, the log transformation was applied for the normalization process. All calculations were performed using SPSS for Windows (vers. 18.0, SPSS Ltd.,Woking, Surrey, UK). The descriptive statistics (mean values, standard deviation) for values of eggshell and egg content were analyzed by one-way analysis of variance followed by the Tukey honestly significant difference test. Within-species values between egg shell and egg content were also compared. Differences were considered significant at the p<0.05 level. Spearmans correlation was applied to inspect correlations between metals concentration. The accuracy of the applied analytical method was validated by accurate analysis of Certified Reference Materials (CRM) for lobster hepatopancreas (TORT-2, National Research Council Canada). The results obtained on the SRMs are showed in Table 1. The recoveries of all the metals were satisfactory. Our results indicate significant differences in heavy metals concentration in eggs among species. concentration of trace element which analyzed in present study were found to exist in higher levels in egg content than in egg shell of avian species, except for Fe and Co which found significantly (p<0.05) elevated in eggshell of birds species. On the contrary, Zn levels in egg content were significantly higher compare to those levels of eggshell in four species. Meanwhile, As occur in a small increase in eggshell of Guinea fowl and Pigeon. percentage distribution of heavy metals concentrations were clarified in Fig. 1. Distribution of metals in eggshell: Concentrations of metals in eggshell for avian species were presented in Table 2. The highest concentration of Mn was found in quail eggs, while the lowest value was obtained in guinea fowl eggs. Fe was accumulated in elevated concentration in guinea fowl eggshell (1682.9 μg g-1) while a small burden found in quail eggshell (755.05 μg g-1). Levels of Co and Se were found to be less than other essential element and their level does not significantly differ among four species. Cu occurred in high value in pigeon and quail compare to those of chicken and guinea fowl egg shell (Table 2). The pigeon and quail eggs revealed the highest concentration of Zn followed by those of chicken and guinea fowl. Meanwhile, As concentrations were found in small amount in eggshell for all birds and there is not a significant variation among birds species. Distribution of metals in egg content: Levels of seven metals (μg g-1 dry wt.) in egg content of four birds species were showed in Table 3. 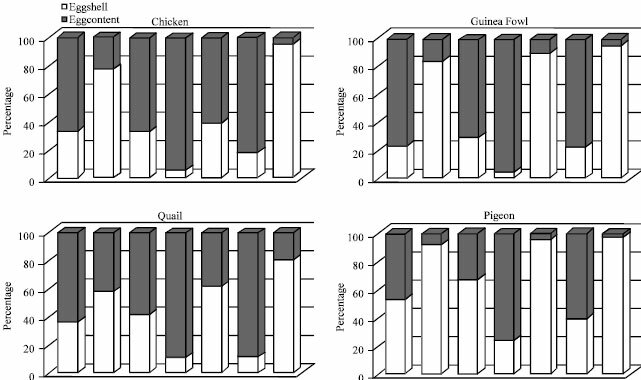 Concentrations of Mn were higher in quail eggs content valued 2.96 μg g-1 than other species and its levels do not differ significantly among birds (Table 3). Fe was occur in less level in pigeon egg content 51.08 μg g-1 while it found in elevated value reached to 183.5 μg g-1 in quail egg content. Guinea fowl and pigeon were gathered slight levels of Co burden compare to those in quail and chicken. Cu concentration was significantly (p<0.05) high in quail egg content than other species. While, a small level was found in pigeon egg. On other hand, Zn occupy the second rank of high level after Fe (reached up to 48.4, 25.2 μg g-1 in quail and pigeon, respectively). Arsenic was exist in large concentration in chicken compared to those of other birds. Spearman correlation was performed to detect the relationship between metals concentration in eggshell and egg content, For quail egg, there is a significant relationship between concentration of Cu (Fig. 2a) Co (Fig. 2b) and Fe (Fig. 2c) in eggshell and egg content were. Correlation coefficients were 0.94, 0.86 and 0.99, respectively. As well as, positive correlation for Se, Mn and Zn concentration in eggshell and egg content was determined. For chicken egg there is a significant correlation (p<0.01) between the level of Co in egg shell and egg content in Correlation coefficients were 0.99 (Fig. 3a). Further, there was a positive correlation for Zn concentration were found between eggshell and egg content in chicken egg. We found a good relationship (r = 0.92) between concentration of As in guinea fowl eggshell and egg content (Fig. 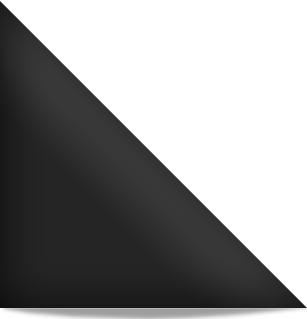 3b). 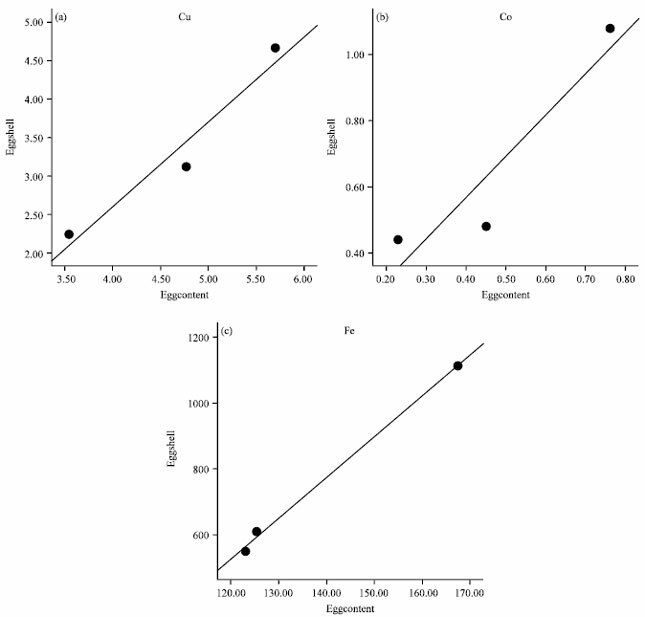 In addition, we found a positive correlation (r = 0.5) for Se, Cu, Zn, Co and Fe in eggshell and egg content in guinea fowl. In pigeon egg, a positive correlation was found for Zn and Fe level between eggshell and egg content. With correlation coefficients 0.56 and 0.50, respectively. Distribution of metals in egg content: Present study confirmed that a large variation in metals concentrations among domestic avian eggs, this differences may be resulted from Several physiological and biological processes, like feeding habits, growth, molting and reproduction, may affect in the distribution and concentration of metals in the egg of birds (Kim and Koo, 2008) and they may be the results of the physiological differences between the size of the four birds, where small birds have high metabolic rates (Welty, 1975) while higher metabolic rates may cause fast accumulations of metals in the body of birds and the eggs. Nonetheless, more studies are apparently needed to determine the effects these factors on metal accumulation in the birds. Aditionally, feeding behavior and different ability for birds to ingest soil and grass may causes such variation (Nisianakis et al., 2009). However, other causes like food and location could not have contributed to such differences due all birds in present study were kept in the same area and fed common diet. Present results for trace element concentration in egg content for the different domestic avian species could be compared to individual metals levels reports in the literature mainly for chicken egg due to its relative importance. Concentration of Mn, Cu and Zn in chicken egg content in present study valued (0.88, 2.223 and 34.22 μg g-1), respectively. This values were higher than other values previously recorded by Van Overmeire et al. (2006), in the same time this result were found to be almost similar to the levels of metal reported by Nisianak et al. (2009) and levels of these metals in pigeon egg content were in agreement with this last study. Concentration of Co and Se for chicken egg content ranged (0.15 and 1.153 μg g-1, respectively) were exceed it values reported previously by Van Overmeire et al. (2006) Meanwhile, The Arsenic burden was found in high concentration in chicken egg content compare to those in pigeon egg content, similar observation was also reported by Nisianakis et al. (2009). Fe concentration in chicken egg content (78.5 μg g-1) was higher than value measured prior in Nigeria (Fakayode and Olu-Owolabi, 2003) Levels of metals (e.g., Mn, Cu, Zn, Co and Fe for domestic pigeon eggs investigated in current study were less compare to those levels were previously record in feral pigeon eggs by Nagel et al. (2001). Distribution of metals in egg shell: For eggshell, due absent the information for heavy metals concentration for eggshell in chicken and other domestic birds in literature, we compared our result of metals levels in eggshell with eggshell for wild birds. levels of most trace element in current study were relatively low in eggshell than egg content except for Fe and Co. Zn occur in small value in egg shell than in egg content, these levels of concentrations are in good agreement with those reported in prior studies for passerine eggshell by Mora (2003). However, all essential element necessary for full development of embryo, as well as to essential trace element and other material organic and inorganic toxic potentially harmful to embryonic development are also transferred from tissues of the laying female birds to egg content (Ohlendorf and Harris on, 1986). Further, female of the bird can excrete some metals in their eggs and egg shell (Burger, 1993), transfer rates of these substances are considered to be related to the concentration in tissues of the female (Nyholm, 1998). According to the results (Fig. 2, 3), metal concentration of eggshell can give a good picture about metals levels in egg content. present study showed the significant correlations between concentration of Co, Cu, Fe, As in eggshell and egg content in egg of each birds species. Thus, this result indicates that level of these metals in eggshell reflect their levels in egg content, on other terms the eggshell can be used as an indicator for these metals concentration in egg content. We concluded from recent study that the domestic avian (chicken, quail, guinea fowl and pigeon) can accumulate heavy metals in their eggshell and egg content in various concentration although all avian feed the same diet and live in the same location. However, egg content accumulate a high levels of most these metals compare to those in eggshell. Furthermore, eggshell can used as an indicator for some metals concentration (including Co, Cu, Fe and As) in egg content of the same species. In other term, eggshell can reflect concentration of these metals in egg content. Present results has provided important information of the distribution of Mn, Fe, Co, Cu, As, Se and Zn in chicken, quail, guinea fowl and pigeon eggs which might be useful in further biomonitoring studies in Malaysia. We take this opportunity to thank the Department of School of Environmental Science and Natural Resources, UKM, Malaysia for kindly providing all of the samples collected. Burger, J., M. Gochfeld, C. Jeitner, S. Burke and C.D. Volz et al., 2009. Mercury and other metals in eggs and feathers of glaucous-winged gulls (Larus glaucescens) in the Aleutians. Environ. Monit. Assess., 152: 179-194. Burger, J. and B. Eichhorst, 2005. Heavy metals and selenium in grebe egg from Agssiz national wild life refuge in northern Minnesota. Environ. Monit. Assess., 107: 285-295. Burger, J. and M. Gochfeld, 1988. Nest-site selection by roseate terns in two tropical colonies on Culebra, Puerto Rico. Condor, 90: 843-851. Burger, J., 1993. Metals in avian feathers bioindicators of environmental pollution. Rev. Environ. Contam. Toxicol., 55: 203-311. Fakayode, S.O. and I.B. Olu-Owolabi, 2003. Trace metal content and estimated daily human intake from chicken eggs in ibadan, Nigeria. Arch. Environ. Health: Int. J., 58: 245-251. Furness, R.W., 1993. Birds as Monitors of Pollutants. In: Birds as Monitors of Environmental Change, Furness, R.W. and J.J.D. Greenwood (Eds.). Chapman and Hall, London, UK., pp: 86-143. Kim, J. and T.H. Koo, 2008. Heavy metal distribution in chicks of two Heron species from Korea. Arch. Environ. Contam. Toxicol., 54: 740-747. Kovacs-Nolan, J., M. Philips and Y. Mine, 2005. Advances in the value of egg and egg components for human health. J. Agric. Food Chem., 53: 8421-8431. Layman, D.K. and N.R. Rodriguez, 2009. Egg protein as a source of power, strength and energy. Nutr. Today, 44: 43-48. Mora, M.A., 2003. Heavy metals and metalloids in egg contents and eggshells of passerine birds from Arizona. Environ. Pollut., 125: 393-400. Nagel, P., G. Smrekan and D. Haag-Wackernagel, 2001. Use of feral pigeon egg for urban bio monitoring. Fresenius Environ. Bull., 10: 18-25. Nisianakis, P., I. Giannenas, A. Gavriil, G, Kontopidis and I. Kyriazakis, 2009. Variation in trace element contents among chicken, turkey, duck, goose, and pigeon eggs analyzed by inductively coupled plasma mass spectrometry (ICP-MS). Biol. Trace Elem. Res., 128: 62-71. Nyholm, N.E.I., 1998. Influence of heavy metal exposure during different phases of the ontogeny on the development of Pied Flycatchers, Ficedula hypoleuca, in natural populations. Arch. Environ. Contam. Toxicol., 35: 632-637. Ohlendorf, H.M. and C.S. Harrison, 1986. Mercury, selenium, cadmium and organo chlorines in eggs of three Hawaiian seabird species. Environ. Pollut. Ser. B: Chem. Phys., 11: 169-191. Parslow, J.L.F. and D.J. Jefferies, 1977. Gannets and toxic chemicals. Br. Birds, 70: 366-372. Shang, S. and H. Wang, 1997. Flame atomic absorption spectrometric determination of copper, zinc, calcium, magnesium and iron in fresh eggs using micro volume injection. Talanta J., 44: 269-274. Sparks, N.H.C., 2006. The hen's egg-is its role in human nutrition changing? World's Poult. Sci. J., 62: 308-315. Surai, P.F., 2002. Natural Antioxidants in Avian Nutrition and Reproduction. Nottingham University Press, Nottingham, ISBN: 9781897676950, Pages: 615. Van Overmeire, I., L. Pussemier, V. Hanot, L. DeTemmerman, M. Hoenig and L. Goeyens, 2006. Chemical contamination of free-range eggs from Belgium. Food Add. Contamn., 23: 1109-1122. Welty, J.C., 1975. The Life of Birds. 2nd Edn., W.B. Saunders, Philadelphia, PA., USA., ISBN-13: 9780721692319, Pages: 623. Wolfe, R.R., 2006. The under appreciated role of muscle in health and disease. Am. J. Clin Nutr., 84: 475-482. Young, R.A., 2005. Toxicity profiles: Toxicity summary for cadmium. Risk Assessment Information System. University of Tennessee.